There’s something about a hexagon that feels so modern and fresh. It’s all the perfect angles and edges, I think. 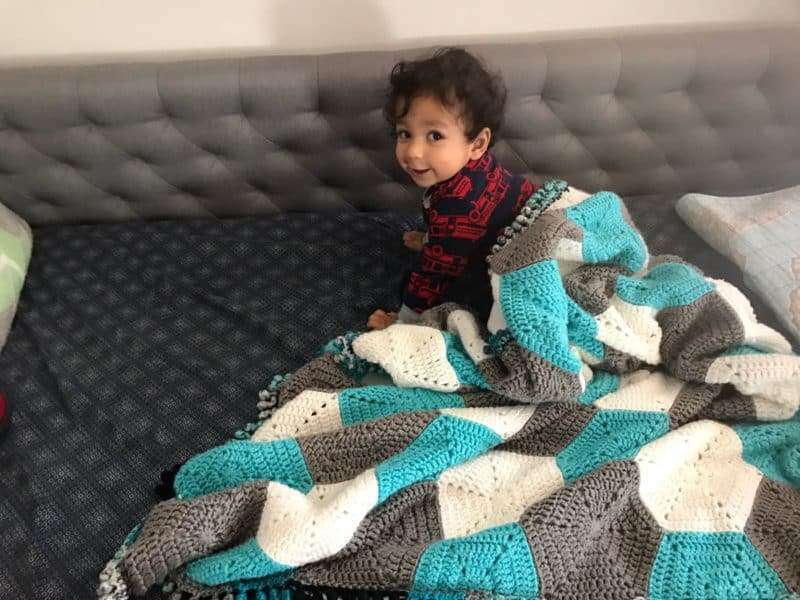 Recently, I had a custom order request from a lady who wanted something modern and colorful for her little boy, and I immediately thought, “Hexagons!” This is the Hudson Blanket, a super easy crochet baby blanket pattern that has just the right pop of color. 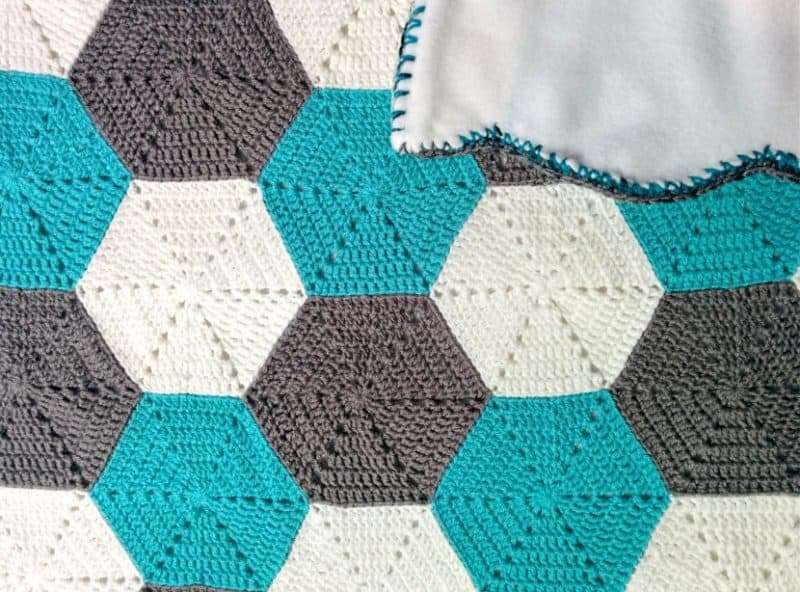 The entire blanket is made up using a simple hexagon pattern and then it’s seamed together. 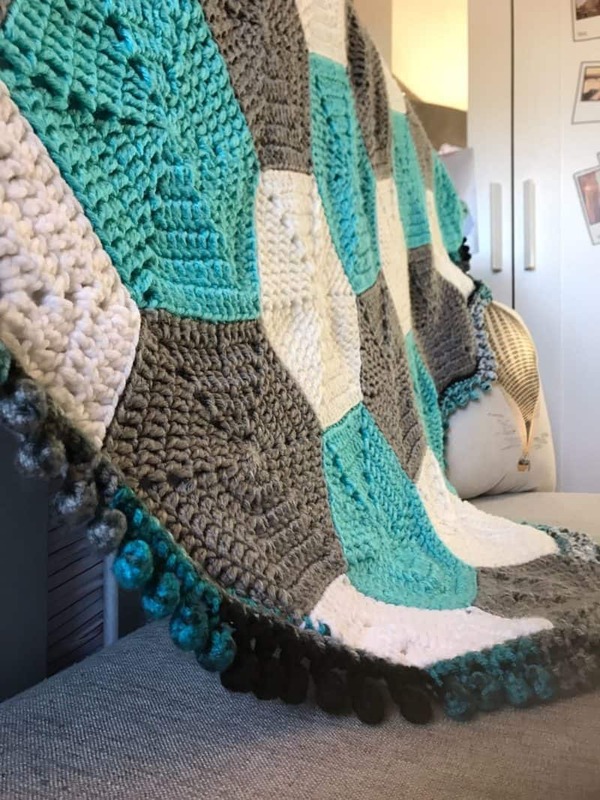 I also added a fleece lining to add some weight to the blanket and finished it all off with the most fun bobble border you’ve ever seen! 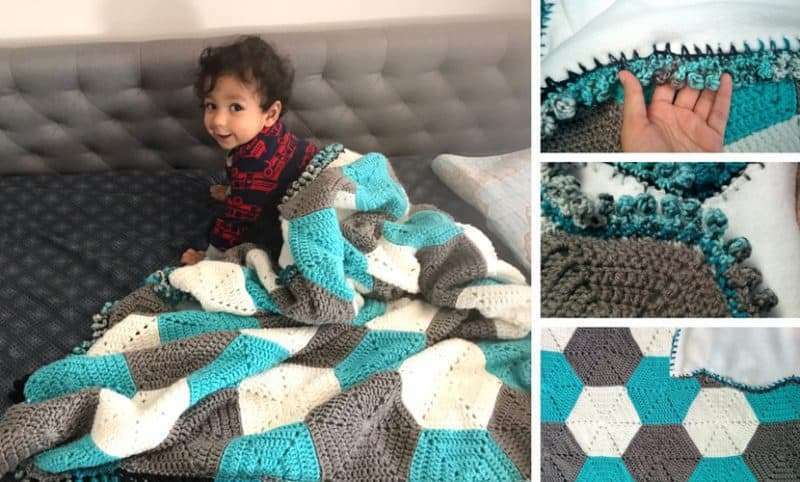 If you get tired or frustrated with creating a blanket in rows and turning the whole things around, you’re going to love this pattern. The Hudson blanket is just a bunch of different hexagon shapes in different colors and they’re each made separately. 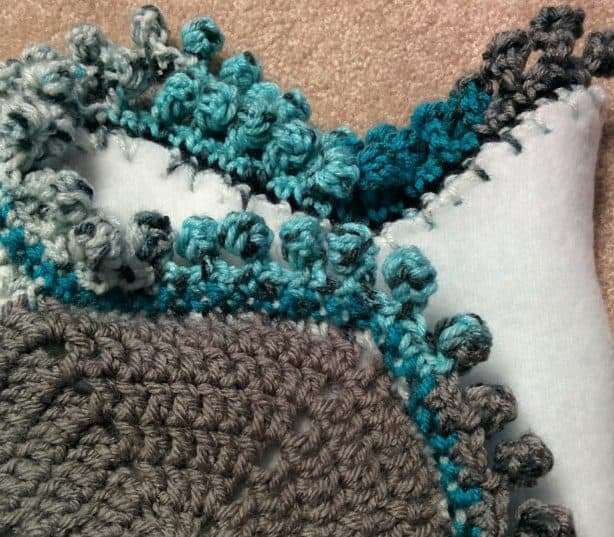 It’s much faster and easier to whip up a stack of smaller shapes than to work on a large blanket. Once all the hexes were made, all I had to do was seam them all together. That step does take a bit longer, but it’s an easy task to do and goes by quickly when you have Netflix on. 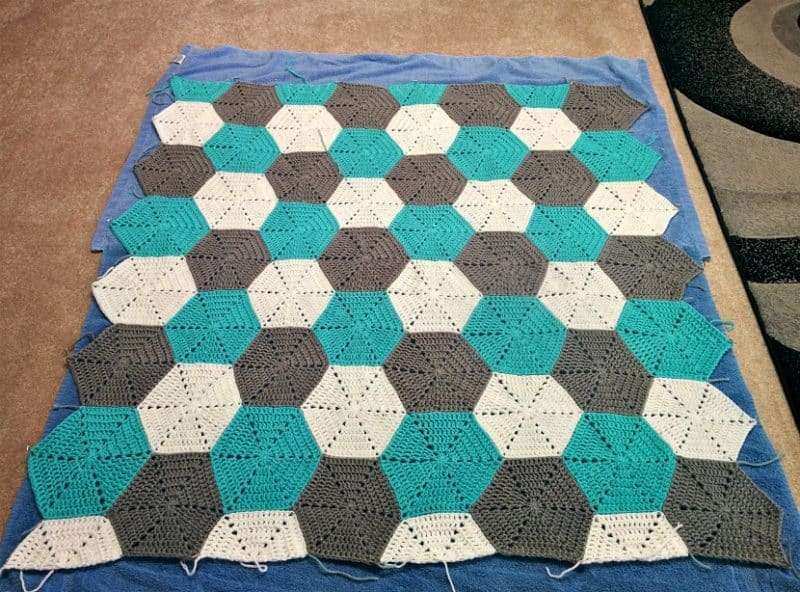 To finish my hexagon blanket off, I even create a few half hexagons so that two of the side would be straight. I did this because I wanted to add a fleece lining to make my blanket a bit heavier and snugglier. I also added a bobbly pom border all the way around to finished it all off and give little fingers something to grab onto. Don’t you love how it turned out with that multi yarn? 8 skeins of #4 worsted weight yarn – I used 2 each in I Love This Yarn in Greybeard (Color A), Turquoise (Color B), White (Color C) and Aegean Stripe (Color D) for the border. For the hexagons and half hexagons, I’ve written out the full pattern below. 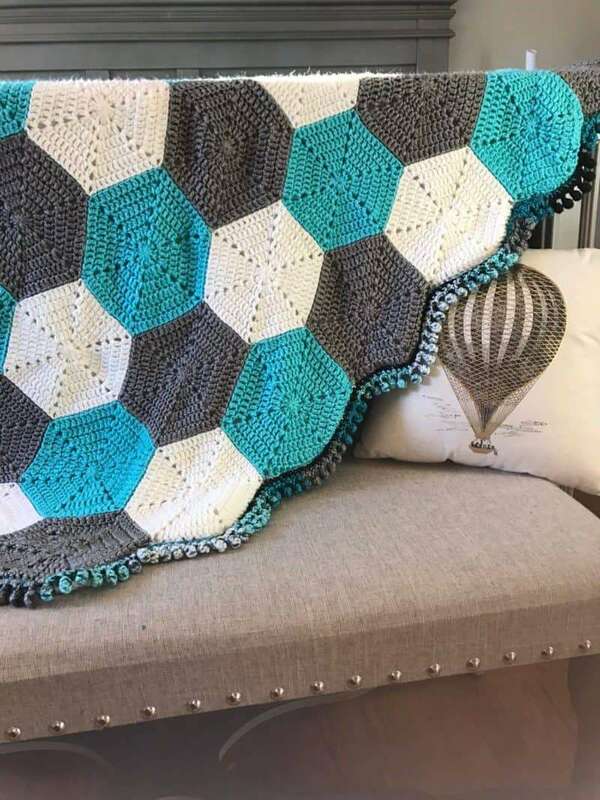 I’ve also done another post that goes more into detail on how to crochet hexagons and there’s a video tutorial there too. Make 20 of these in Color A (Greybeard), 16 in Color B (Turquoise) and 16 in Color C (White). Round 1: Start with a magic loop and secure it with a slip stitch. Chain 2 (count as DC). Work 1 DC into the magic loop. Chain 2 again. *DC 2, chain 2* five more times into the magic loop. You should have 6 sets of DC and 5 chain-2 spaces now. Slip stitch to the top of the ch 2 to finish the round. Then, pull the loop closed. Round 2: Start the next round with a chain 2 (which will again count as a DC). Work one DC. Then, into the chain-2 space from the previous round, work this pattern: DC, chain 2, DC. This will give you another eyelet on top of the one from the round before. *DC 2, [DC, ch 2, DC] into the ch 2 space* all the way around the crochet hexagon. When you get to the end of the round, slip stitch to the top of the chain-2 to finish the round. You should have 4 DCs per side. We’re going to continue increasing until our hexagons are the right size. If you like, you can work more to make bigger hexagons than mine or fewer to make them small. Round 3: Chain 2, *DC 3, then work [DC, ch 2, DC] into the chain space of the previous round*. Repeat from * to * all the way around the hexagon. DC 1, slip stitch to the top of the chain-2. (6 DC per side). Round 4: Chain 2, *DC 4, then work [DC, ch 2, DC] into the chain space of the previous round*. Repeat from * to * all the way around the hexagon. DC 2, slip stitch to the top of the chain-2. (8 DC per side). Round 5: Chain 2, *DC 5, then work [DC, ch 2, DC] into the chain space of the previous round*. Repeat from * to * all the way around the hexagon. DC 3, slip stitch to the top of the chain-2. (10 DC per side). Round 6: Chain 2, *DC 6, then work [DC, ch 2, DC] into the chain space of the previous round*. Repeat from * to * all the way around the hexagon. DC 4, slip stitch to the top of the chain-2. (12 DC per side). Round 1: Start with a magic loop and secure it with a slip stitch. Chain 2. Work 1 DC into the magic loop. Chain 2 again. Your first chain 2 counts as a DC. * DC 2, chain 2* twice more into the magic loop. Pull the tail ends to close the loop. You should have 3 sets of DC and 2 chain-2 spaces now. Don’t worry if the edge doesn’t seem completely straight; it’ll be blocked later. 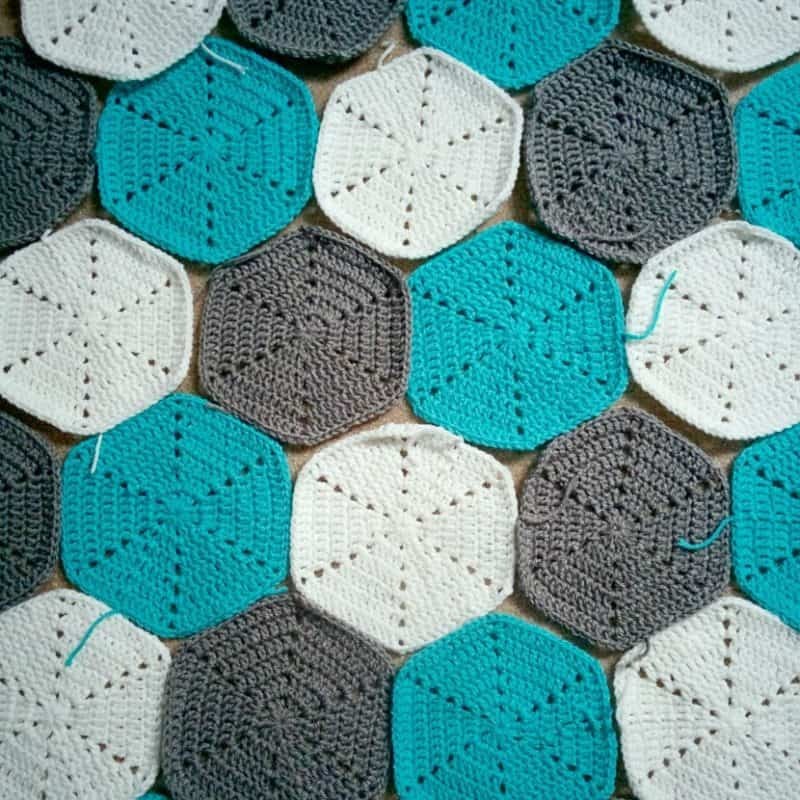 Once you have all of the hexagons, it’s time to arrange them in the pattern you want and sew it all together. For my blanket, this is the pattern I followed. Repeat these rows three more times to finish. Then, thread your tapestry needle with a long length of yarn and use the invisible seam method to attach each hexagon to the one next to it. I did all of the short sides first so that I had long rows of hexagon strip, and then I went back and sewed the rows together. It’s sort of like piecing together a quilt. It does take a while to do, but it’s easy and you just need to spend some time on it. I hate seaming, but the effect is so nice that I really do think it’s worth it! Weave the tail ends in as best you can. Don’t worry too much about it though; as long as they don’t show on the front, they’ll either be covered by the fleece or worked into the border. For me, the best part of this hexagon baby blanket (and most of the baby blankets I make) is the fleece lining. 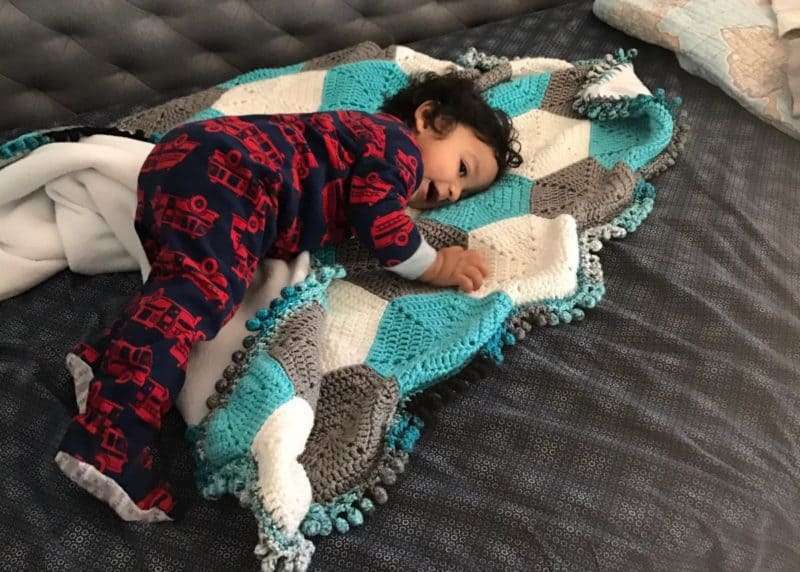 It adds weight to the blanket and stays on the baby when they move around, and it has a comforting presence. It also makes the blanket much softer and warmer. However, if you don’t want to add the fleece, you can go ahead and skip to the section on adding the border. Before adding the fleece, lightly block the blanket so that all the hexagons are as they should be. They might have gotten a little out of shape if you sewed them too tightly together or a little unevenly. But a simple blocking will fix that and make sure that two of the edges are straight. I have blocking mats now that help align the edge but if you don’t, a couple of towels works well too. On a large surface, lay out your fleece and smoothe it out. Then, lay your blanket on top of it, matching up two of the edges. Smoothe it out and make sure it all lines up. 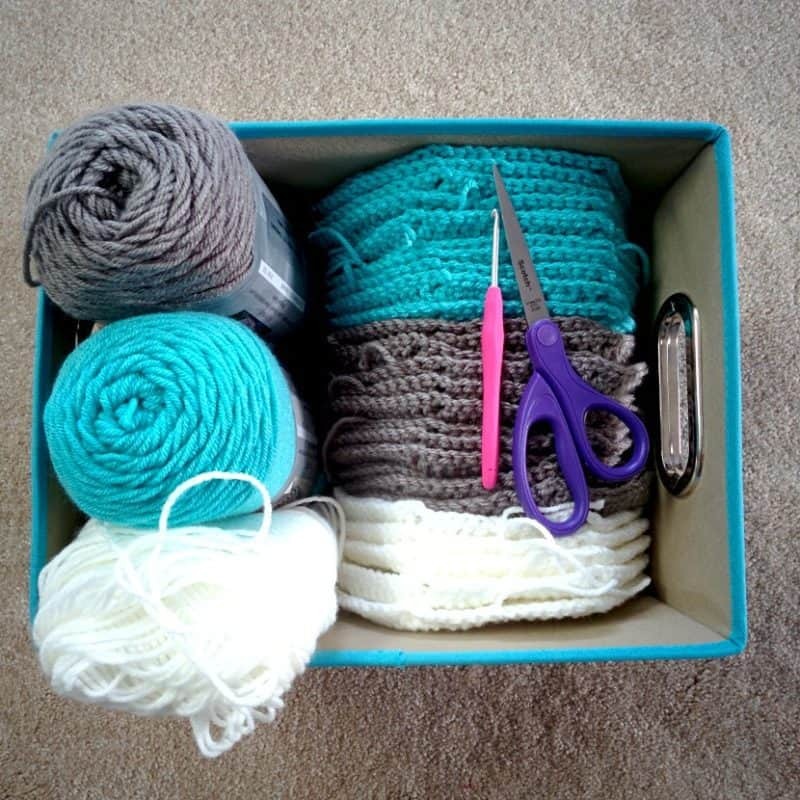 Using a pair of sharp scissors, cut the fleece to a little bigger than the size of the blanket. Make sure to not to cut the yarn! Remove the blanket for now and let’s just work with the fleece. This is where we’ll make the holes into the edges of the fleece so that we can insert our hook into it to crochet the fleece and blanket together. 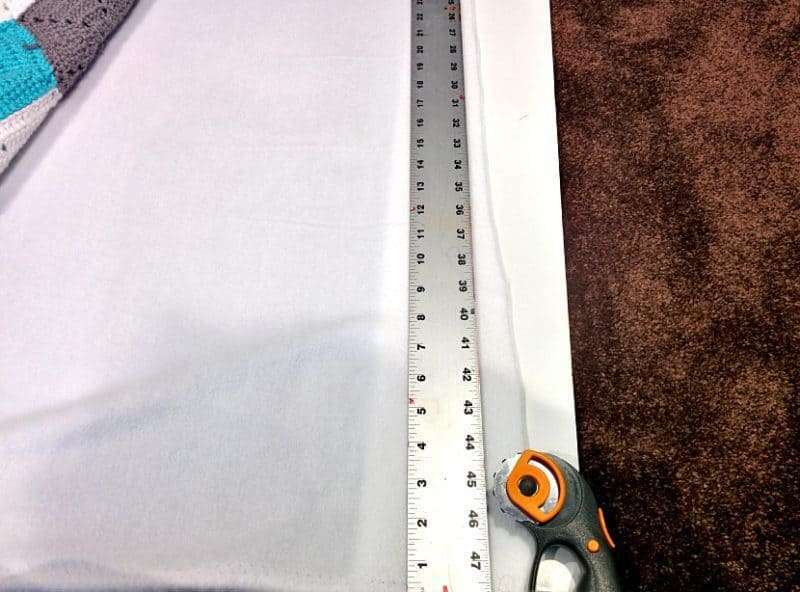 Put a cutting mat or a piece of cardboard under the edge of the fleece to protect your surface and bring a ruler about a quarter inch away from the edge of the fleece. Then, run your skip stitch down the side of the ruler. The skip stitch is the same as a rotary blade, but it perforates as it cuts into the fleece, rather than cutting a straight line. Work down all four sides of the fleece so that you have small slits along each side. Now let’s secure the fleece to the blanket! Bring the blanket back to the fleece and line up the first corner. 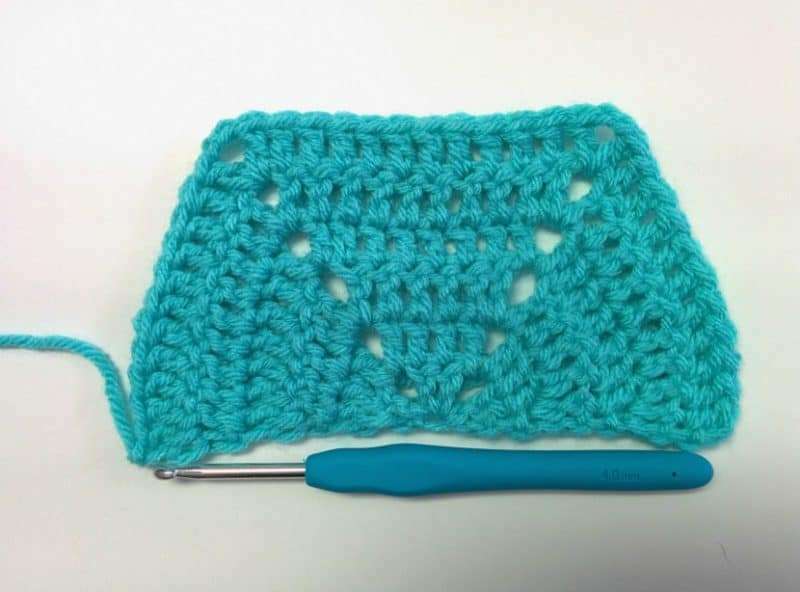 With your crochet hook, attach yarn in the border color (Color D). Work 1 SC just in the corner of the blanket. Then, SC down the side going through the spaces in the crocheted blanket and the slits made in the fleece. At the corner, ch 1, rotate the blanket and work down the next side. 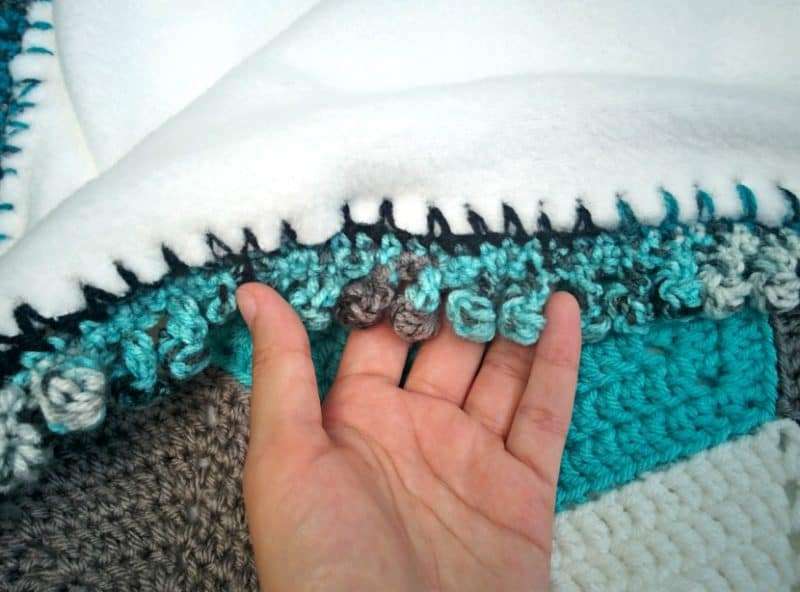 This round gives you the first round of your border and attaches the fleece to the blanket. Work one more round of SC around the blanket, making sure to ch 1 before turning the corners. 1. Chain 5 at the corner of the blanket. 2. Into the 2nd chain from the hook, work 1 HDC but only pull the yarn through the first two loops. You’ll have two loops remaining on the hook. Work 3 more HDC the same way, being sure to only pull through the first two loops each time. 3. You should now have 5 loops on the hook. YO, and pull through all 5 loops. 4. 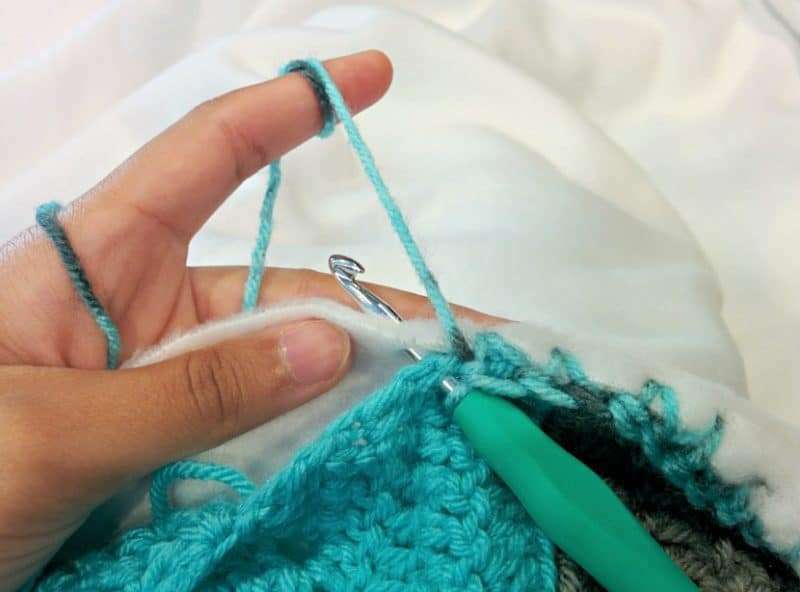 Slip stitch into the same space to finish off the bobble. 5. Slip stitch twice into the next two chain spaces. 6. SC into each of the next two SC spaces. Repeat steps 1-6 all around the blanket and bind off. 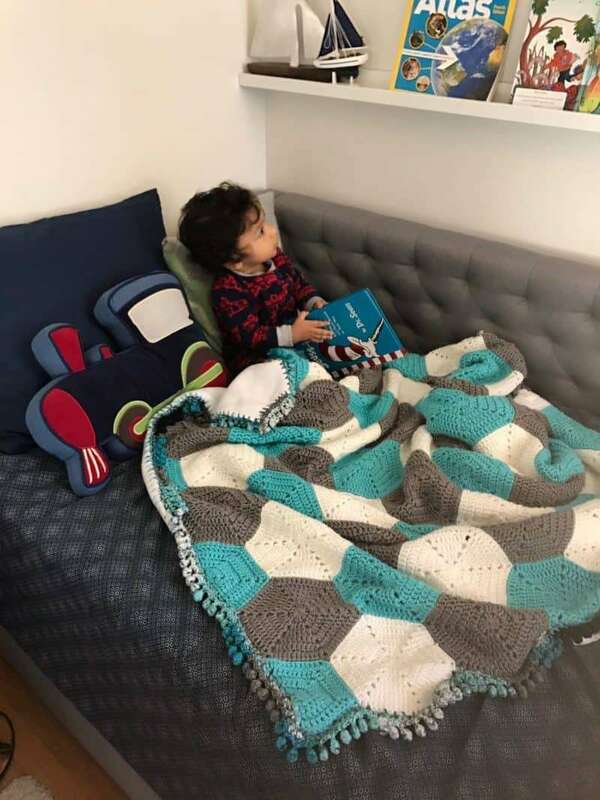 I hope you guys love the Hudson Blanket as much as we do! 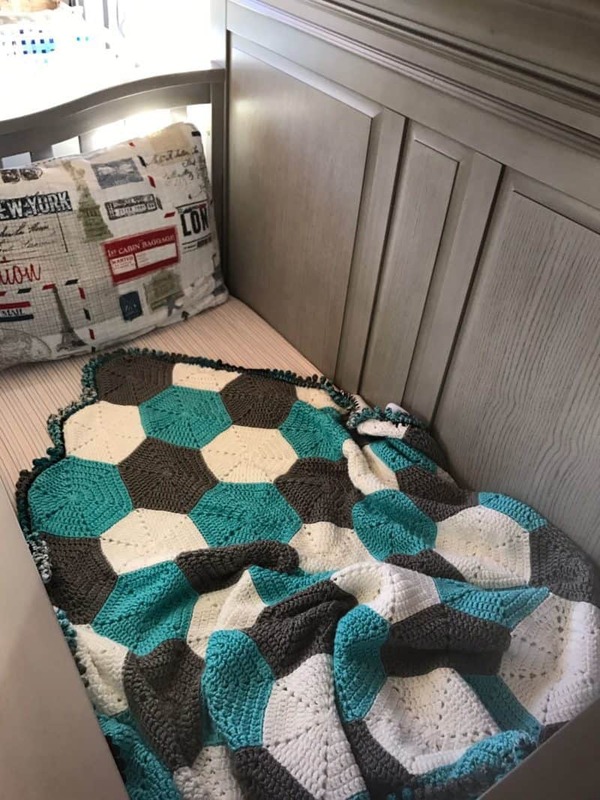 If you would like to see more free patterns delivered to your inbox every week, sign up for the newsletter using the box below. 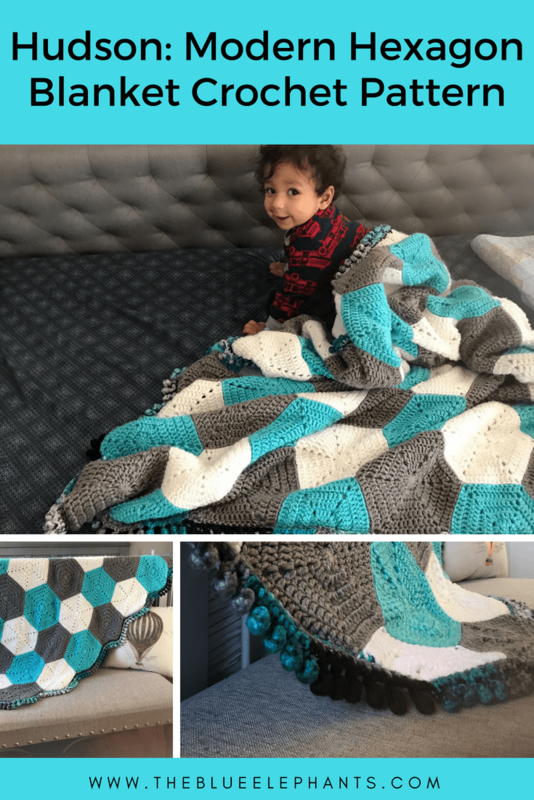 You’ll also get access to the subscriber-only resource library with freebies like my Crochet Blanket Sizing Guide and more. Thanks so much for reading! Love the fleece on the back! Pretty pattern too. Thank you for sharing on Merry Monday! Have a great week!